For all my fellow Whovians! 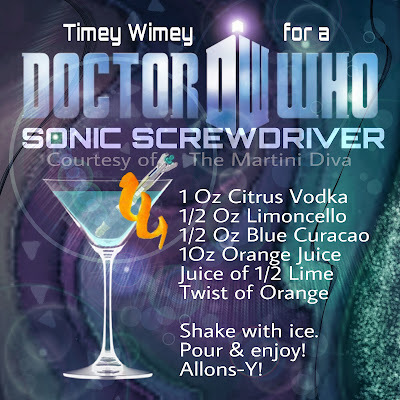 This ought to reverse the polarity of your neutron flow! "Somewhere there’s danger, somewhere there’s injustice, somewhere else, the vodka has run out." 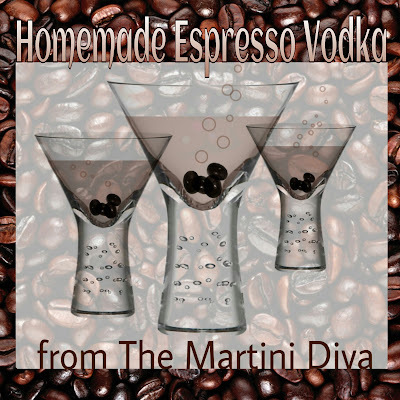 Since today is National Espresso Day I thought it was the perfect time to share my secret Espresso Vodka Recipe with you. Why is it secret? Because I cheated and used a French coffee press! Add 1/2 cup of ground espresso to your coffee press. Pour in 3 cups (nearly the whole bottle) of vodka. DON'T plunge at this point. Allow this to infuse for 15 minutes, no more or your vodka will become too bitter, THEN plunge. Strain through a cheesecloth lined strainer into the measuring cup. Transfer your Espresso Vodka into a decorative bottle, label and enjoy in some of the Espresso Cocktails below. BTW, you can easily turn this Espresso Vodka into Espresso Liqueur! Simply add in some simple syrup to your preferred level of sweetness. You can even add fun, flavored syrups like chocolate, caramel or hazelnut. The addition of chocolate syrup is almost like a homemade Kahlua! Cheers and Happy National Espresso Day!